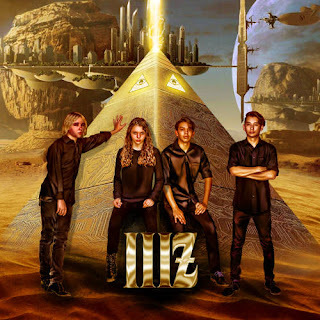 IIZ [pronounced 'eyes'] self-titled debut album is rather experimental electronic dance music and punk-rock but is accessible to the masses. The band members are young and what an album to debut their talent. Ison Van Winkle main vocalist has a distinctive vocals that seems and sounds very much from the punk scene of the '70's and through the early to mid-80's. Mari is the second vocalist and her voice adds the mid to high notes that has some good attitude in her delivery. Jacob plays the grooves on Bass and Ross adds the drums, which both of them change and sound different when the music changes from EDM to more punky and choppy vibes. Breaking the album up as the EDM songs are quite anthem let's-cement-ourselves-to-music-history-now-sounds in the hip-hop beat of the first track Get Away ft. Sen Dog [Cypress Hill], next up is the 4 to the floor beat with head-nodding squeaks in Manic Pixie maybe some crazy thoughts, person or substance? The Light is the best EDM track that'll goosebump you'all for sure unless you're a cold stone, the song is nicely sung by Mari which describes either a romantic meeting or a spiritual vision. If this what the song title says then going to sleep is probably hard-work as the sound of Epic Dreams MIX1 has a real punch! There are songs that fuse the EDM and punk-alternative-indie-rock which is the let's raise our hands up in Sugar, and this theme is twinned well in Cure. The more punky groovy songs are the congo and big beat getting back to a vintage them sounding Retrospective. In this ranting of Color On The Run makes digs at parents or mothers in particular that are not happy with the choices of their offspring, or acceptance of them as people. A more stronger rock sound occupies Want and all of the give me everything now culture that is captured in this song. Analyst a psychological ride probably too many psychologists at school? Though in Man In The Background refers to blending in, or if in a strange place wanting to fit in. Probably the best punk-rock track is Strawdogs on the album. Finishing with I Never Knew MIX1 Voxup has all of the ingredients to end the party with a mixture of keyboards and alternative indie scores to leave you feeling buzz-up'ed!